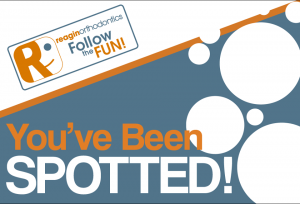 Each week we are on the lookout for the Reagin Orthodontics smile sticker on your car. Weekly winners can chose a $25 gift card from our gift card station! If you are spotted we will leave you a note and you can turn in your note and pick up your gift card at your next appointment. If we are able to snap a picture of your vehicle, we will post the picture on Facebook and be on the lookout for you at your next appointment! This is exciting by itself, but have you heard what will happen with our 44 winners in October? All of them will be entered in a drawing for a free set of braces! If you are currently in treatment your balance will be zeroed out or you can be a good neighbor, and gift the free set of braces to someone in need! Make sure you “Like” us on Facebook at www.facebook.com/ReaginOrthodontics to know if you are a winner!